Landscape design and construction , excavation, earthworks and rockwalls . I have always had a love of the subtropics and the ecosystem and climate that goes with it. As a child my family lived in many parts of southeast Asia for many years growing up which has had a strong influence on my style of work. 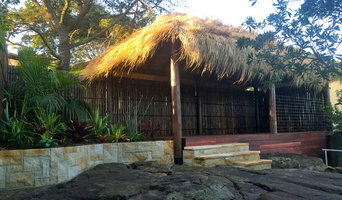 I have been in the business of structural landscaping now for 25 years, coming from a background of working on organic farms and also having worked and studied bush regeneration prior to studying landscaping. 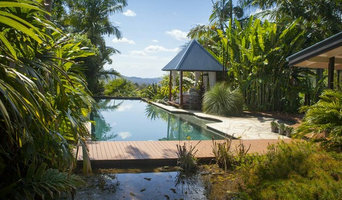 I first moved to the Byron area 20 years ago so I feel I have a good understanding and knowledge of the local area and its plants, soils and materials. I love the diversity this area offers from the tropical areas in the hills down to the coast and have worked extensively with both to create beautiful landscapes to both admire and enjoy. I am extremely passionate about my work and absolutely love what I do and enjoy going to my jobs each day, I get a great sense of satisfaction by being able to express my artistic creativity through my ability to work with my hands. My business also has a strong focus on sustainability and the environment. We like to use local, recycled and environmentally friendly products where possible. My business can accommodate for any job size and budget and have a team of happy, enthusiastic and experienced workers that work professionally and efficiently together. 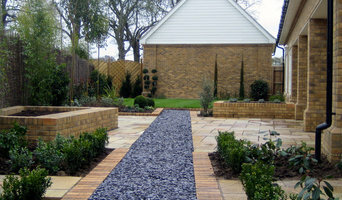 We cover all aspects of structural landscaping. Certified Horticulturist with 15 years experience. Fully insured for peace of mind. We service the Tweed Coast from Tweed Heads to Byron Bay. Services we offer: Landscape Design and Construction Decks & Pergolas Fencing - Timber, Steel, Glass & Colourbond Paving & Tiling Ponds & Water Features Garden Maintenence Turf & Synthetic Grass Retaining Walls Let us create your own private landscaped escape or get your yards looking gorgeous for spring & summer. OUR PURPOSE IS TO CREATE VALUE We do this through the management, design, construction and maintenance of fit for purpose landscape and renovation services creating lifestyle solutions in the natural and built environment. We uphold our commitment based on our Charter including: Values Principles Service Excellence Sustainability We have a unique culture that has enabled us to deliver a proven track record of outstanding results across the diversity of projects we undertake. WE HAVE UNPARALLELED EXPERTISE IN DELIVERING PROJECTS ON QUALITY, TIME AND TO BUDGET Our experience and commitment to excellence means our customers can be confident that we will co-ordinate and manage assets and projects professionally. Our capability and proficiency of alliance and partnering as an option to deliver projects competitively has allowed us to have a proven and successful track record. We have built a reputation for providing innovative, value added solutions for home owners, builders, developers, government agencies, and independent companies. Our aim is to provide exceptional service for outdoor spaces of all styles & sizes: residential, holiday & commercial - through personal commitment to high standards & customer satisfaction. It is our aim to ensure that your garden looks its absolute best & continue to thrive all year round. Our experienced & passionate team will treat your garden as their own: with care, integrity and respect. We strongly believe in the positive health benefits a garden provides it's visitors & strive to maximise these effects, along with a pleasing aesthetic experience. Our services provide a reliable, qualified horticulturist who loves their work & take pride in the results. Schedule of planned works, with regular detailed notes, correspondence & communication with you on and off site. Confirmation of appointments and rescheduling in case weather conditions are extreme. The highest quality materials, plants and soils for your garden. Our team manager is a qualified Landscape Designer, accompanied by 10 years of experience caring for gardens professionally and creating landscape installations. Hello, I’m Lyn Ruming and I have lived in Byron Shire on the North Coast of NSW for more than 25 years. In 2003 I completed a TAFE course “Principles of Garden Design” which was instrumental in combining the various skills and knowledge I had acquired over the course of my life. I love plants, gardens and the natural world and designing gardens is something that I really enjoy. I grew up in country NSW and a long way from the ocean and now I cannot imagine being away from it for more than a few days. My parents introduced me to gardening when I was quite small. I remember planting tiny seeds and running out every day to see how they were growing. To my great disappointment those first seeds turned out to be radishes. Not at all what my young palate was seeking. My grandfather was a keen gardener and lover of birds. He would always have fresh beans, luscious tomatoes, sweet corn and beautiful flowers. I owe my fascination with birds and gardens largely to him. My garden is quite small but surprisingly spacious and I love my veggie patch. The tiny space produces an abundance of lettuce, herbs, Chinese greens, spinach and of course beans. Lots of birds and lizards visit the garden and it pretty much takes care of itself. I’ve lived on acreage as well as in town so I can relate to most experiences of north coast living. I’m down to earth, very practical and I love Nature. I’m a fairly private person myself so I recognize that it is an honour to be invited into your home and garden. We’re all unique, with different likes and dislikes, and I will use my extensive knowledge to help create spaces that satisfy your needs. I know first hand what a difference the right environment can make and I’d like to share that with everyone. Out There Sculpture Garden is a unique boutique nursery in the Arts and Industry Estate of Byron Bay. Specialising in Garden and Landscape Design, Mosaic Pottery. 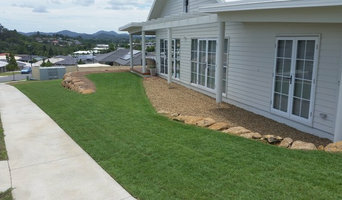 What can a Bexhill, New South Wales landscape contractor or gardener do? 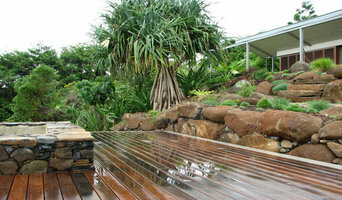 Find landscape solutions and Bexhill, New South Wales gardening services on Houzz. Scroll through this page to find professionals that offer landscaping and gardening services in your area. You can browse their latest projects, read reviews and see how other homeowners rate their work, and message them directly.